I'm sure you've realized that the site looks different. Not a little different, a lot different. I replaced the paw print background with a photo of Christmas. I added some cool effects to it. The reason I changed the background is because it is a unique background. The paw print one is automatically provided by Blogger, so I wanted my background to be different, and something that would show readers who Christmas is when they first visit the blog. The header is also different (not sure if it is temporary or not), and now it's a collage of all things Christmas! Because of the background change, I edited some of the other things on the page, such as the post box color, and some of the fonts. I decided that even though I'll post just as much as I do now, I'm going to try and focus the blog a little more on Chris. He'll pretty much be the star. He has a huge personality and letting him "write posts" occasionally and showing the world what it's like to train, show, and live with a Dachshund is something I want to get across to my readers. Don't worry, the other two dogs, the cats, the snails, and the hermit crabs will still be appearing quite often! Readers, prepare to see a bit more of Christmas here and there...it's important to show Blogville who he is, especially Blogville is more focused on one specific pet instead of the human author and the entire pack of pets. This is sort of hard to explain, but to make a long story short (a little too late for that I think), Christmas will be the main animal star on the blog, and it's going to be a fun and bumpy ride. 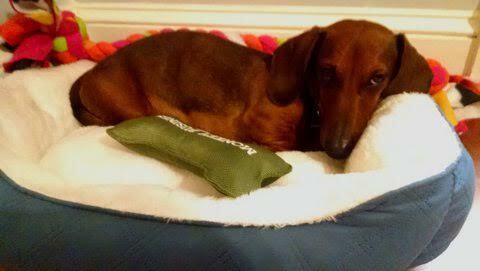 Fasten your seat belts and prepare to see more of my precious Dachshund! Thanks! :) I'm not against the paw print background or anything, and I think it looks great on your blog, Chester! Bow wow, enjoy your day! Hot diggity, thanks you guys! We love your new background, Christmas! Hot diggity, thanks so much, Frankie and Ernie! My mommy and I are also very pleased with the new design...we're actually going to change our background again within the next week. My mommy likes this background, but she wants it to be a photo that isn't edited and is of me in the grass in the sun. Something more natural and bright, she says. We'll take the perfect shot soon! After all, mommy knows best! The background is very cool! Thanks! Hot diggity, I'm glad you two came by today! Hello!! We're new to your blog, but what a cute picture!! Happy St. Patty's Day! Thanks for stopping by, and if you haven't already, you can also become an official member of Paw Province! Bow wow, we're happy you're here! Christmas being a Dachshund has a HUGE personality as all Dachshunds are so I is looking forward to hearing all about his adventures! I luffs the new background! Thanks for all your kind words (or barks? ), Princess Leah! As you mentioned, us Dachshunds are totally amazing creatures. Oh, and so are the other dogs in the world! I'm so glad you like the background! Your new background looks great Christmas! Hot diggity, thanks, you guys! BOL! I still like your current header though, Easy!